Feel like you're getting ripped-off by your bank? Harassed by debt collectors? 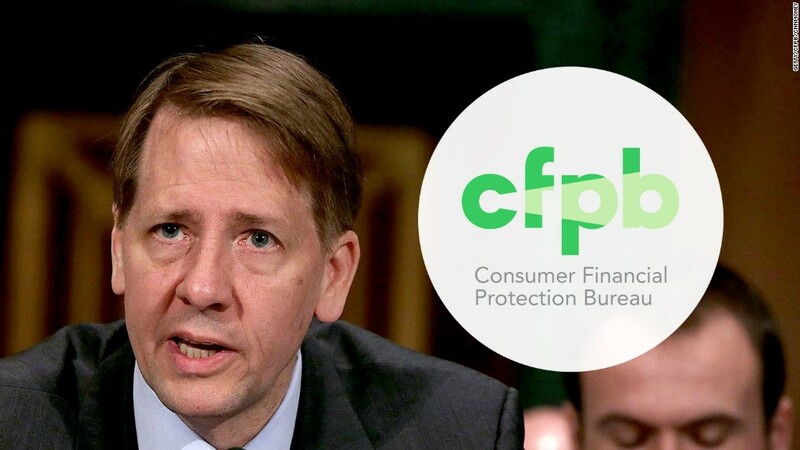 For nearly two years, the Consumer Financial Protection Bureau has maintained a giant public database of consumer complaints that now contains more than 700,000 grievances against financial companies. The agency has handled more than one million complaints since 2011. But the CFPB, which was created in the wake of the Great Recession to help protect consumers, is now in jeopardy. Last week, Republicans Senator Ted Cruz and Representative John Ratcliffe introduced legislation that would abolish the CFPB. The CFPB was created by the 2010 Dodd-Frank Wall Street Reform to protect consumers against unfair and deceptive practices. It has rulemaking, supervisory and enforcement powers. It's been tracking issues and helping consumers resolve problems since its inception. Consumers can submit complaints about a financial product or service to the CFPB, which then sends them to the company. Companies have 15 days to respond. Once a company responds or the 15 days lapse, the complaints are then published in a public complaint database. Consumers have to give consent, and any personal or identifiable information is redacted before going online. The agency uses complaints to help identify trends and patterns and intervene before problems become bigger issues. It also shares some complaint data with applicable state and federal agencies. "Complaint information gives us a real-time window into what consumers are experiencing," said Darian Dorsey, deputy assistant director for the CFPB's Office of Consumer Response. Debt collection is the most complained about industry, noted Dorsey, taking up roughly a quarter of all complaints. Mortgage-related issues are also a major complaint along with credit reporting and credit card companies. "That data provided bread crumbs to major quagmires in some financial institutions," said Rohit Chopra, who worked at the CFPB for five years after it launched and is now a senior fellow at the Consumer Federation of America. "Those clues helped the consumer agency detect where financial institutions were breaking the law." He said complaints resulted in the government taking action against a student loan servicer in 2014 over claims of charging unlawfully high interest rates to military members. "I consider the complaints system a mechanism for consumers to be informants." The database has also improved customer services at banks, he added. "The advent of the public database means banks are competing to have the fewest number of those complaints." Opponents argue the agency has too much power and overregulates, which can increase costs for businesses and harm consumers. "The CFPB has been very aggressive deploying the powers it has across the regulations of consumer and financial services, including banks," said Cliff Stanford, a corporate lawyer and partner at Alston & Bird. He said banks pay attention to the database, but that the information customers provide often isn't verified. "The industry has been very concerned that the database is such raw data that it can give the public and anyone looking at an institution an inaccurate picture of the true state of play," said Stanford. There's also an argument that the agency has too much unchecked power. Republican Representative Jeb Hensarling said the "rogue agency" was "basically a dictator," in an interview with CNBC on February 16. "Now some would argue he is a benevolent dictator, but no one person in America, particularly an unelected person, should have the power unilaterally to decide what credit cards go in our wallet, whether or not we can have a mortgage and whether or not we like our bank or we can keep her." But Chopra said the agency and its database helps keep the market honest. "If we had this system before the financial crash, I think there would have been earlier and more decisive action to combat toxic mortgage lending."